11 entries categorized "ET CETERA'S"
DID WE REALLY SELL THOSE ?? RECENTLY, YOUR EDITOR BOUGHT AN ANCIENT B.H. ADVERT FROM AN AUSSIE SOURCE THRU EBAY, AND IT WAS DULY DELIVERED, AFTER HAVING INFORMED THE VENDOR THAT IT WOULD BE POSTED ON B.H.M. WELL, SHOWS YOU WHAT A GENEROUS MOB THE AUSSIES CAN BE, BECAUSE THE VENDOR, KEITH WEINEL HAS SINCE SENT A FURTHER SIX OR SEVEN OLD B.H. ADVERTS, FROM PERIODICALS IN THAT PART OF THE WORLD, FREE OF CHARGE & FREE POST, BECAUSE HE JUST LOVES OUR WEBSITE. We would like to thank Keith publicly for his very kind gesture, and hope he likes his name in lights on the site !! Without more ado, the adverts are laid out below, and the meaning of the title of this article is because we hadn`t heard of some of these Aussie agencies before, so we learn something new yet again. We are also posting some of the reverse pages, because they also have interest. ....and finally this one, and please note in a land now dominated by giant trucks upto 400 ton capacity, these were the biggest trucks in Australia in July 1960, R40`s !! Once again many thanks to Keith Weinel for his contributions, and in case anyone wants to contact him direct to buy something, please find his business card below. THE FOLLOWING ADVERT WAS DELIVERED TO US THE OTHER DAY FROM TERRY MYRING. He found it in a bookshop whilst looking for other material, and kindly sent it in. We have had to reduce it from something approaching A3 size to make it fit our scanner, but the good lady at Colemans in Higham Ferrers did an excellent job, and here we have the finished result, which we assume is from the USA, from the magazine "The Saturday Evening Post", October 8th, 1955, with a bit of everything shown from muckshifting of those times, but the Euc looks best !! IS THAT DAN DARE IN THE CAB ?? FOR THOSE OLD ENOUGH, AND THATS 99% OF YOU, THE EAGLE COMIC WAS ONE OF THE MANY WEEKLY`S AVAILABLE TO BOYS OF ALL AGES IN THE 1950/60/70`S ETC, BUT NOT VERY OFTEN ASSOCIATED WITH EARTHMOVING. ........a MK V, B10LOT TS24 !! You can never see too many TS24`s, although today, you will struggle, but see the note at the bottom of that page, offering 20 Eagle Eye Points if you spot one........well if you do spot one today, and no old fotos from yesteryear will be considered, so dont get clever, then The Editors will make it £20 prize for the best foto of one sent in........dont worry, we are very tight, and dont expect to have to lay it out, but thanks to the ever observant NB for this contribution. SELLING BY C.J., AND OTHERS OF COURSE !! SEVERAL PERIODICAL ADVERTISEMENTS HAVE COME TO LIGHT OVER THE LAST 6 MONTHS, SOME FROM KNOWN PUBLICATIONS, LIKE CONTRACT JOURNAL, OTHERS OF UNKNOWN ORIGIN, BUT ALL RELATING TO EITHER B.H. OR EUCLID FROM DAYS OF YORE. 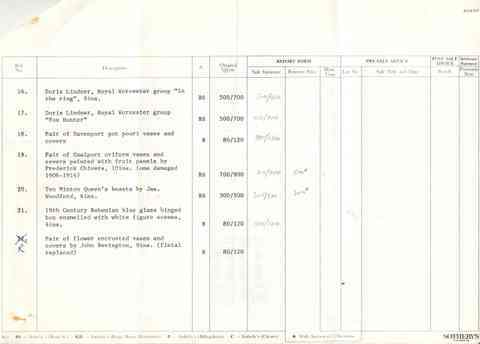 They have also arrived from different sources, some from ebay, and others donated, one such source being honourary Hodgite Tom France, although we are not sure who sent the rest at the moment, so lets just peruse what we have anyway. Firstly we start off with our one time competition.....AEC !! We would imagine not too many true AEC dumptrucks survive, so just recall this image, from CJ, June 1968.......... .....check out that selling price, todays equivalent would be £92,902.17, and as you will also notice, the "Dump Truk" is signwritten in the name of S.L.D.C., the company associated with Mr Niall Hodge !! .......and as we have said before, possibly the worlds first A.D.T., way before anyone could even spell Volvo. ....not the clearest one we have, but clear enough to get the gist. Do any of our Scottish brethren know whether ARC Manufacturing Company Limited of Nitshell, Glasgow is still around ?? ....this one however being slightly differnt as it has an acknowledgement to the artist, one Kenneth McDonough...is anybody aware of this mans history, if so, please let us know. ....our Eric Orlemann Euc book is mislaid at the moment, so we cant give you the model type. ....it has lost a little sharpness through re-scanning, but you can see here a typical example of the corporate image B.H. exhibited in that period. Some of the images will be familiar, as we are sure they were used in some B.H. brochures of that time also, certainly the ones of Ken George. Many thanks to all contributors, and if anybody recognises either of the artists` names mentioned above, or indeed had the good fortune to meet either, please let us know, as certainly in the case of Raymond Sheppard, Mr Boyd would like to know of any contact any Hodgite might have had with him. The Editors. THE OTHER SIDE OF THE SALESMAN.......Anon. THE FOLLOWING ARTICLE APPEARED IN 1976, IN BH NEWSLETTER, ANONYMOUSLY, BUT REPUTEDLY FROM A SALESMAN`S WIFE !! We dont know whether anybody ever owned upto to the tome, but if the lady is still out there, or if anybody does actually know who she is, we would be more than grateful to know, and to give her the accolade she most richly desereves, despite the 36 years which has passed since she wrote it. Great stuff, so lets hope we can make contact with the author after all these years !! Roger Betts, 1963-67 & 1969-72, along with some fotos to be found in Days Out section, included a couple of pages from a Contract Journal magazine from June 1967 that he had kept. Nothing very specific in these articles, but interesting to see some company names mentioned that are mostly no longer around, and also some general chat about the industry at that time. ONE OF OUR HONOURARY HODGITES, TOM FRANCE, HAS SENT IN A COUPLE OF SMALL ITEMS, WHICH WE HAVE INCLUDED HERE, MOSTLY BECAUSE WE WERE NOT SURE WHICH SECTION WOULD RELATE TO BOTH, SO WE KEPT THEM TOGETHER. 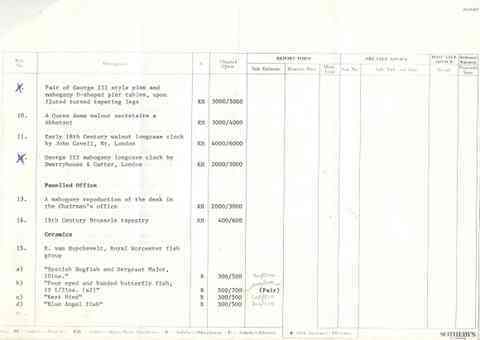 .....dont know whether you can read the Directors listed at the bottom....G B Heaney, J A Kelly, W I J McNab, P G H Newton, A J Ramsden, W Rankin & I C Smith....and the other mention in Tom`s mail is of the Used Equipment dept, an advert he has kept from 1987....nearly as sad as we are......... with the almost last HML team of Bailey, Reeve & Brealey. ANYBODY HAVE ANY IDEA WHAT A JCB 5052 HYDROCHIEF WAS ???? CERTAINLY CHEAP !! WE`RE SELLING THE FURNITURE !! 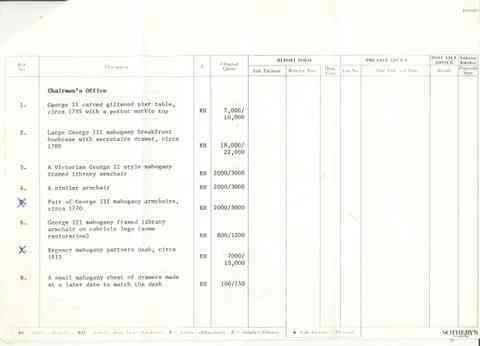 VERY INTERESTING COPIES FAXED TO US TODAY FROM A SOURCE WHO WISHES TO REMAIN OBSCURE, (HE ALWAYS WAS ACTUALLY) OF THE SOTHERBYS ESTIMATES OF THE FURNITURE & PARAPHINALIA TO BE FOUND IN 25 BERKELEY SQUARE, AFTER IT WAS RELINQUISHED BY THE COMPANY IN 1988, AND THE REMAINING INMATES DECAMPED TO DOVER STREET. QUITE A FEW NOTES WORTH FROM THE LOOK OF IT....WOULD HAVE TO HAVE SOLD A FEW 33-11`S TO PAY FOR THAT LOT. HANDS UP IF YOU EVER SAT IN THE MOST EXPENSIVE CHAIR !! 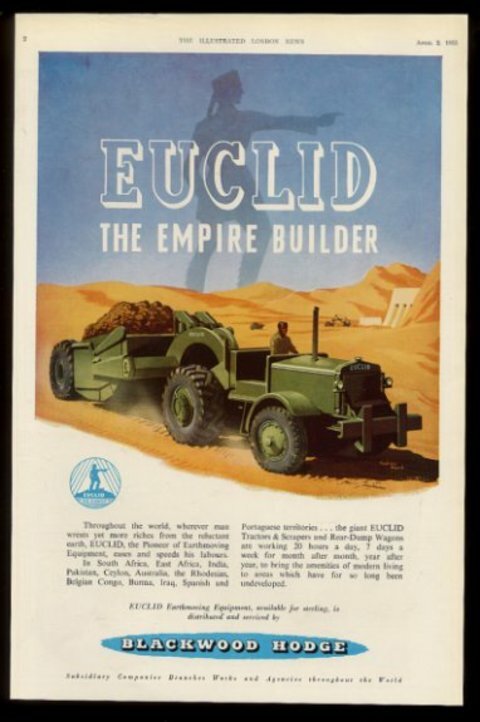 ......"THROUGHOUT THE WORLD, WHEREVER MAN WRINGS YET MORE RICHES FROM THE RELUCTANT EARTH, EUCLID, THE PIONEER OF EARTHMOVING EQUIPMENT EASES AND SPEEDS HIS LABOURS. IN SOUTH AFRICA, EAST AFRICA, INDIA, PAKISTAN, CEYLON, AUSTRALIA, THE RHODESIAS`, BELGIAN CONGO, BURMA, IRAQ, SPANISH & PORTUGUESE TERRITORIES, THE GIANT EUCLID TRACTORS, SCRAPERS & REAR-DUMP WAGONS ARE WORKING 20 HOURS A DAY, 7 DAYS A WEEK, MONTH AFTER MONTH, YEAR AFTER YEAR, TO BRING THE NECESSITIES OF MODERN LIVING TO AREAS WHICH HAVE FOR SO LONG BEEN UNDERDEVELOPED. EUCLID EARTHMOVING EQUIPMENT, AVAILABLE FOR *********, IS DISTRIBUTED & SERVICED BY BLACKWOOD HODGE"
QUITE POETIC REALLY, REMINDS ONE OF A DIFFERENT AGE OF ADVERTISING, AND ALSO AS TO THE EXTENT BH HAD REACHED BY THAT TIME ! !